Back in August 1997, I stumbled across a page of Sonic fanfiction and found myself hooked. Since then, my best friend and I have been creating our own stories to share with the world. Below you will find our archive of stories, including our story arc "The Race for the Emeralds". Also included are pictures we have begun to draw of the characters we have introduced. Our e-mail is below if you want to contact us. Happy Reading! Just when we thought Antoine would never get a girlfriend, he finally gets one. ;) This story is the first that explores the idea of Antoine and Bunnie being in love. Here's the next part. This time we find out how Bunnie got roboticized, and also explore a little more of Bunnie and Antoine's relationship. A mysterious stranger arrives in Knothole unconscious.... Combined with a vision, Sally becomes determined to join her father in the Void. Sonic's got to stop her. Need I say more? Antoine and Bunnie are getting closer, Sonic and Sally are getting closer... but now, Sondra and Tails begin to develop feelings for one another too and it's up to Sonic and Sally to lay out the facts of life for them. For guidance, Sonic seeks out the Tanak' Shi-rat... and finds the unexpected. Snively decides to strike against the Freedom Fighters by eliminating their weakest link. The creature that he sends out to do this knows Antoine quite well, and the battle that follows is intense. Sondra ponders the truth about her creation and, with the help of the Freedom Fighters, confronts the evils of the Void and rescues Naugus and King Acorn... but perhaps at the cost of her own life. Read on! A romantic evening between Bunnie and Antoine gets ruined when Bunnie accidently crushes Antoine's ribs. Angry at her robotic limbs, Bunnie wishes she could get rid of them...and maybe she'll get her wish. Christmas approaches on Mobius, and so does Sondra's birthday. But it seems that perhaps there are some who are ready to commit treason because of Sondra's origins and her link to the throne. Meanwhile, parts of Donovan's past are revealed, while Rosie and Tanis rekindle an old relationship. It's deep in the midst of winter. Usually, when a Freedom Fighter is in danger, Sonic comes charging to the rescue. But this time it's Sonic himself who is captured, and Sally must go to Robotropolis to free him. Sonic goes off on his own to find himself. On the way, he runs into his long, lost parents, and they're in real hot water, battling/running from an ancient spirit. Will they survive? Read on. Sally's beginning to think that maybe Sondra isn't taking her position very seriously. However, Sondra's capabilities are put to the test when Sally is captured and robotizized, and it falls on her to lead the Freedom Fighters. It's a good day in Knothole. Sonic and Antoine are up to something. Only they know what it is, but it'll certainly be a day that neither Bunnie nor Sally will ever forget. Well, the King is back, but he's not acting like his old, cheerful self. When he attempts to lead an assault on Robotropolis, they find that the evil of the Void has a hold on his mind. Meanwhile, Sonic's mother isn't feeling too well.... What could be possibly causing it? The Race for the Emeralds is on when the Fire Emerald is spotted in a volcano. It's up to the Freedom Fighters to get it before Robotnik does. Can they do it? The answer may surprise you. On her way back from Robotropolis, Lydia comes across Dorian, a former traitor, severely injured. When she takes him back to Knothole, tensions rise, and both Sally and Lydia have a hard time to keep violence from breaking out. Donovan returns and he has constructed an illusionary and deadly maze at the center of which a Chaos Emerald is hidden. Both Robotnik abnd Sally must try to make it through the maze. You'd be suprised who gets there first. But is this Emerald for real? Bunnie is summoned by the spirits of her ancestors and has to undergo a test to prove if she is worthy to learn the Ultimate Fighting Techniques. When the Kavenoff invades the sacret place and Antoine's live is in danger, it's up to Bunnie to save him. But will she be able to without misusing her new skills? Sally's eighteenth birthday is approaching, and according to the laws of Mobius she will lose her chance to become Queen if she cannot truly ascend the throne by that day. Since Robotnik is still the one in power, this seems to be impossible. Will Sally's friends be able to find a loophole in the rules to give her additional time? Christmas time is approaching once more on Mobius. Only this time, Sondra is ready for it. She has gifts for almost everyone, but the gift she plans to give Sonic may be dangerous to get. In the meantime, it appears that Patricia has a present for all of Knothole. Part one of a two-part story. All of Knothole thinks Sondra's and Patricia's presents are the best ever. However, Nadia has a present in mind for Donovan that could beat them both. But she needs Sondra's help to pull it off. And in her weakened condition, there could be dire and irreversible consequences. Part two of a two-part story. The Freedom Fighters have found the location of the Wind Emerald, however Robotnik isn't going to give it up without a fight. But is the fight over before it begins? Dulcy is at a crossroad in her life, one that not only affects her, but her entire species. This is a journey she cannot travel alone, and those who join her may find their lives forever changed. The time has come to destroy the Kavenoff. There's just one problem: he has the Shadow Emerald. Will they be able to defeat him and end his reign of terror, or will Chaos be reborn on Mobius? Lightning doesn't strike twice... or does it? 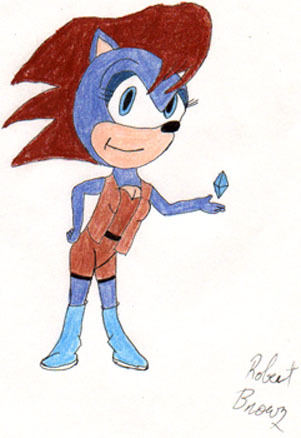 Snively's after the Lightning Emerald now, the last Emerald that needs to be decided. Will the others get a chance this time, or will it be over before it begins? Adding to the problems, Sonic seems to be settling into a funk of sorts.... What could be causing it? All the Emeralds are decided, but one of them belongs to someone who's not supposed to be involved in the Race. More to the point, the Emerald is inside him. Can the Freedom Fighters get it out safely, or will something else happen to it? Sonic vs. Robotnik. All seven Emeralds and the fate of Mobius on the line. 'Nuff said? Robotnik is defeated, Mobotropolis is restored, and now comes the day everyone has been waiting for. With many surprises and a lot of happiness, this story marks the end of the Race for the Emeralds, but also the beginning of a new journey. It's been eighteen months since we last posted a story, and almost that many years have passed on Mobius. A new generation is up and coming, and this story's sole purpose is to acquaint you with some of them. But who knows what the future holds for these "Chosen Ones". But don't worry; we won't take nearly as long before our next story. Thank you all for your great support to this point, and we hope it's been worth the wait. We've met the Chosen Ones and seen some of the changes that have occurred over the past seventeen years. But the single thing we get asked most about is that mysterious robed figure that's been appearing regularly. Well, your questions are about to be answered, and I'll say no more. Happy Reading! The attack in the last story was a costly one, but only the next day does the aftermath become clear. As Sally tries to cope with the crisis, she remembers a trip she must make. But this trip turns out to be no vacation as Sally finds herself right in the middle of it all. What will become of her? Read and find out. The Freedom Fighters finally find out what's going on as well as who's behind it. But there's no rest for the weary as the Fallen Ones are determined to strike again. Can the Freedom Fighters stop them in time. Or more importantly, WILL they be the ones to stop them? The Chosen Ones might be destined to face the Fallen Ones, but after their last encounter it's become obvious to their parents just how much training they need. For the past month, the Freedom Fighters have put their children through every kind of torture, I mean training they could devise. Will it be enough for the future? Why don't you read and judge for yourself? An artifact that can recharge the Wind Emerald has been located in the ancient ruins of Maga. As the Chosen One retrace the steps of the Freedom Fighters, they try to stay one step ahead of the Fallen Ones. But just who's keeping ahead of who? That's the real question. As the Chosen Ones heal from their battle wounds, two strangers show up in Mobotropolis. One is well known to the Freedom Fighters, yet the other is a complete mystery. Either way, their appearance is less than welcomed, and opens up scars all the citizens would rather have stayed closed. What are we talking about? You'll find out, as soon as you see who we're talking about. The next artifact capable of recharging a Chaos Emerald has been found, but most of the Chosen Ones are still on restricted duty. Alicia takes advantage of that to try and make up for her imagined mistakes and recover the artifact herself. But the Fallen Ones want her to do just that. Why? And more importantly, what do they have planned for her? Alicia is having a bad day. No, forget that, a bad couple of weeks. Things have just been piling down on top of her more and more because of the choices she's made. But as with everyone, Alicia does have her breaking point. See what happens when that breaking point is reached, and Alicia is beyond reason. Will this lead to even more decisions she'll regret? Or will it all work out for the best? A great many illusions will be shattered this day...that of one's ancestors, one's friends, and even one's self. Will those who are affected be able to survive such startling revelations? And more importantly, what will others do who have orchestrated some of these things? You know how to find out. Some of the Chosen Ones' actions are coming back to haunt them, and an old friend comes bearing disturbing tidings. Couple that with the discovery of a surprising artifact and anything can happen. But then, do you expect any less? It's Sarah's birthday, her tenth one at that. She's looking forward to a magical day full of happiness and love. Unfortunately things don't go quite her way. With an artifact up for grabs and her parents in bad moods, it appears no one's noticed. Well, almost no one, but is that a good thing? It's Christmastime once more on Mobius. The Freedom Fighters and Chosen Ones think they're safe because the Fallen Ones cannot operate on a day like today. Little do they know that another group, potentially even more dangerous than the Fallen Ones, is ready to make its move. Can they survive it, or will their complacency lead to their destruction? And amidst it all, one family gets the chance to be whole again. The events of Christmas night were cold and calculated, now see what those actions have wrought. Will the reuniting of a family cause another one to fall apart? Or will everything that has happened only strengthen the bonds that everyone shares and forge new ones along the way? Either way, many questions will be answered here, though some answers may only lead to more questions. It's finally happened. The Chosen Ones have struck a crippling blow against the Fallen Ones, so much so that they believe they can slack off a bit. This belief costs them greatly however as plans are set in motion that might have been better off laid to rest forever. But once in motion, they cannot be stopped. What will be the results of these plans? Prepare for a major power shift among all parties, as well as the revelation of some important history that a lot of people have been asking about. Enjoy it everyone, it's been a long time coming. The time has come for Desir�e to face her final training, but it is not as simple as that. The Kavenoff has long vowed revenge on Bunnie's ancestors for their last meeting, and now is the time to seek it. Even worse, all of the Chosen Ones are out of the palace, the perfect scenario for the Fallen Ones to retrieve a Fire artifact. A trial by fire indeed. Emboldened by his recent success, the Unholy One splits his forces to try and retrieve both Shadow artifacts at once. But what his arrogance unleashes could spell doom not just for himself and his Fallen Ones, but for all of Mobius. Can anything survive the titanic clash that was fated to come from this? Read ahead and find out. Here's the first picture I drew to go along with our stories. Click here to see Princess Sondra Acorn. Comments, questions, anything but flames? Write Robert here or Francis here.